Okay Atlanta, the annual Record store day at one of the cities music pulse is on the way. Yes I’m talking about DBS SOUNDS Record Store Day if you an artist signed or unsigned this is the place to be Saturday April 16, 2016. 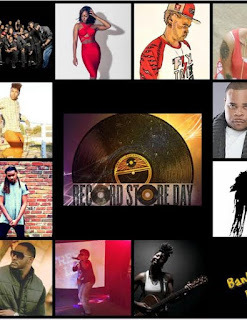 If you are familiar with my blog then you know every year all the industry insiders come out to show love to the Record stores and all their contribution to the labels and artist, this year’s event is being sponsored by Warner Music Group. But it doesn’t stop their DBS Sounds loves to give back to the community so this year they will have barbers on site to give free haircuts, face painting for the kids, live performances and my favorite free food, yes and the food is always on point. Special invited guest this year amongst a host of others is the legendary Slim from one of our favorite groups 112, so make sure your in the building, the event is from 11am – 7pm 6610 Highway 85, Riverdale Georgia.